PATTERSON, N.Y., April 13 (SEND2PRESS NEWSWIRE) — JMT Consulting Group (http://www.jmtconsulting.com/) announced today a special Solution Spotlight track for nonprofit organizations attending JMT’s annual conference INNOVATE 2011. One of the Solution Spotlight sessions will be “Saving Money for Nonprofits Through Hosted Solutions” and will be presented by Stanley Kania, CEO of Software Link, Inc. (http://www.software-link.com/). In addition to the insights shared at the session, INNOVATE attendees have the opportunity to access Sage MIP Fund Accounting in a hosted environment during the conference. * Strategic Insight Into Your Business Planning with Sage Active Planner. The 7th annual INNOVATE conference will be at Mohegan Sun in Connecticut April 27-28. INNOVATE (http://www.jmtconsulting.com/resources/innovate/) is a two-day conference for nonprofit and public sector organizations interested in improving their working knowledge of popular software Sage MIP Fund Accounting and Sage Fundraising 50. JMT Consulting Group is a leading provider of software and consulting services to Community Action Partnerships, Head Starts, Community Healthcare organizations, charter schools, membership organizations and other types of nonprofits. With over 2,000 clients across the country JMT Consulting Group offers a variety of services including hosting, business process improvement, implementation, system selection and system integration as well as a broad portfolio of leading nonprofit solutions, including Sage MIP Fund Accounting, Intacct, Convio, and more, to help nonprofit organizations achieve their mission. 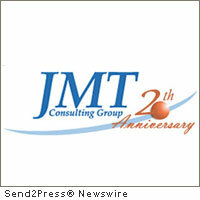 – RSS news feed for JMT: https://send2pressnewswire.com/author/jmt-consulting-group/feed . Original Keywords: Jacqueline M. Tiso, Stanley Kania, Sage Fundraising Online, software and consulting services to Community Action Partnerships, Head Starts, Community Healthcare organizations, charter schools, membership organizations and other types of nonprofits, Sage MIP Fund Accounting, INNOVATE conference JMT Consulting Group Patterson New York PATTERSON, N.Y.
REFERENCES: Finance News, Jacqueline M. Tiso, Stanley Kania, Sage Fundraising Online, software and consulting services to Community Action Partnerships, Head Starts, Community Healthcare organizations, charter schools, membership organizations and other types of nonprofits, Sage MIP Fund Accounting, INNOVATE conference JMT Consulting Group Patterson New York PATTERSON, N.Y.